Known for its bright green landscapes, medieval castles, and its welcoming environment, Ireland is a favourite among international travellers. While visiting Ireland, you can experience the excitement of capital city Dublin. Dublin has lots of attractions and is also one of the best places to experience the unique pub culture of Ireland. After spending some time in the big city, head out to explore more of Ireland. Other cities to visit include Cork, Galway, and Belfast (which is in Northern Ireland and is technically part of the UK). In the Irish countryside, you can experience endless green hills, stunning architecture, and beautiful coastal areas. Between its stunning visuals, exciting culture, and friendly locals, it’s hard not to love Ireland. 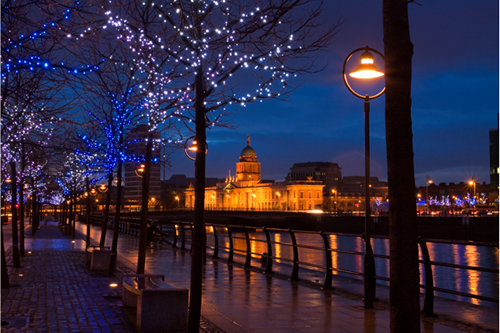 Save money on your next international holiday with Webjet’s Ireland holiday packages. Ireland packages bundle together flights and accommodations to help you find the best deals for your budget. Bundling these expenses can save you hundreds of dollars that you can instead put toward activities in Ireland. Ireland accommodation and flight packages are also a great way to save time planning your trip. There’s no need to spend hours searching for the best deals on hotels and flights. Webjet has got you covered, so you can focus on planning all of the fun aspects of your trip to Ireland. Ireland holiday packages are great options for families as well as small groups travelling together. When planning a trip to Ireland, there are a number of airports that you could fly into. The country’s busiest airport is Dublin Airport (DUB) in its capital city. Other major airports include Belfast International Airport (BFS) in Northern Ireland, Cork Airport (ORK), Shannon Airport (SNN), and Kerry Airport (KIR). Between all of the airports in Ireland, you’ll have no trouble getting to any spot in the country. Travelling from Australia, you can fly to Ireland on lots of different airlines. Some options include Qantas, Virgin Australia, Emirates, British Airways, Aer Lingus, Qatar Airways, and Malaysia Airlines. From the major airports in Australia, you can book flights into Ireland with just one stopover. Flights from Perth arrive to Ireland in about 20 hours, while flights from the eastern cities in Australia will get you to your destination in less than 24 hours. Throughout Ireland, you’ll find a range of accommodation options. In the cities, you’ll find hotels that offer a bit of sophistication and modernity. In the countryside, you’ll find lots of local bed and breakfasts where you can get a true feel of Ireland. Finnstown Castle House is a magnificent manor house that will have you feeling like you’re in a fairy tale. Guest rooms are comfortable and homely with a touch of sophistication. Within the hotel, there are a variety of dining options. There is a large restaurant as well as a lounge serving snacks and two bars. Other amenities within the Finnstown Castle Hotel include a swimming pool and a fitness centre that offers personal training. While the hotel has easy access to the city centre, it is located on the outskirts of the city, offering a quiet and authentic countryside experience. Located in the heart of Cork, the Imperial Hotel is the perfect place to base yourself in the south of Ireland. The hotel building was built in 1813 and has become one of the most iconic buildings in the city. There are 45 guest rooms that are decorated in a luxurious contemporary style. Within the Imperial Hotel, there are several dining options. There is a full restaurant, a cafe, and a cocktail bar. The hotel also serves a lovely afternoon tea. The Park House Hotel is a welcoming spot right in the heart of Galway. The hotel offers 84 guest rooms designed in a comfortable high-end style that will have you feeling right at home in Galway. In the hotel, you’ll have access to a restaurant that serves food throughout the day and also offers room service. The Park House Hotel is considered one of the best in Galway and the perfect place to stay while visiting the west of the country. Ireland is a scenic country teeming with history, beautiful countrysides, unique architecture, and an exciting culture. Start your holiday in the bustling capital city of Dublin, then continue your adventures in Ireland with a road trip around the country. There is so much to explore between the cities of Cork and Galway, the many castles, rolling green hills, and rugged coastline. This historic university is located in the heart of Dublin. It was founded in 1592 by Queen Elizabeth I and has been attended by several famous people through the years. As well as several Irish presidents, Oscar Wilde and Samuel Beckett also received their educations here. Take a walk through the campus to admire the gorgeous stone buildings. Then head over to the university’s Old Library where you can see the famous Book of Kells. This book dates back to 800 AD and is the oldest book in the world. It includes a series of gospels accompanied with elaborate illustrations. Tickets to see the Book of Kells cost €11 ($17.70 AUD) for students, €14 ($22.50 AUD) for adults, and €28 ($45 AUD) for a family of four. On the west coast of Ireland, you can visit the world-famous Cliffs of Moher. These sea cliffs are located in County Clare and are about 14 kilometres (9 miles) long. Visitors can admire the cliffs and witness the stunning sea views. From the cliffs, you can see the Aran Islands in the sea as well as the Maumturks and Twelve Pins mountain ranges. The Cliffs of Moher are one of the most stunning examples of sheer natural beauty in Ireland. One of the most popular spots for travellers to visit in Ireland is Blarney Castle. This castle is located in the south of the country near Cork and is home to the famous Blarney Stone. The stone is a slab of limestone that has been part of the castle since 1446. Legend has it that kissing the Blarney Stone will gift you with eloquence and flattery in your speaking style. To receive this gift, lie on your back and lean over the side of the castle (with a Blarney Castle employee holding onto you), and give the Blarney Stone a kiss.